You are new to magic mushroom cultivation. No problem, we have what you need. Order this FreshMushrooms® Grow kit starter set and receive all the items to become a successful mushroom home grower. The set includes a heating mat and items to create your mini mushroom grow room. The kit can be used once. The other items will last so next time you just need to order a new magic mushroom grow kit. Happy growing! Growing with the FreshMushrooms Grow Kits is extremely easy. These FreshMushrooms kits are completely maintenance-free thanks to a fully colonized substrate without fillers. You hardly have to do anything to get your first flush with high levels of psilocin. Follow the instructions below and you will be assured a high harvest of mushrooms! Splendid Customer Service and Product. Great all round kit, buy without hesitation. Delivered as promised in very discreet packaging, and produced about 27g dry from first flush in about 11 days. Beware, I found the heating mat to be much too harsh, seeming to raise the temp far too high (the box felt hot to the touch and it gave off an odour). I corrected this by using a mini-tower of jar lids between box and mat and using a probe thermometer brought the temp to sensible level. However, for a while I was really worried I'd killed the mycelium. For the second and third flushes I ditched the mat and grow bag and instead used a plastic storage box with lid open an inch and based with damp perlite. This box was heated by a second box below containing a submerged aquarium heater. Everything seemed much better with this arrangement. However despite this I'm still delighted with the kit. It has enabled me to resume my psychedelic journey following a 33 year break. I bought this to make things easier for myself. It's been quite hot here for the past few weeks (Holland), and so I didn't need the heating pad. It's useful to have though for when it gets colder and I want to grow. The mushrooms themselves were very slow to grow due to the high heat (around 29 degrees Celsius in my house). I didn't mind the wait, it happened in perfect timing. The mushrooms themselves, Mazatapec, were friendly and healing, used with respectful healing intention. True medicine. They are healing when used with respect. The sprayer works excellently if you keep it upright. I didn't use the gloves or mouth cover, and had no contamination problems, because the Freshmushroom kits have strong/well-developed mycelium (the white stuff) so they are very resistant to contamination. This is perfect for beginners as it's very forgiving. Apparently this is true for the Supagro kits too, but I haven't experienced those yet properly yet. I received a Supagro sample but it had weak mycelium and unfortunately became contaminated, so I had to throw it out, but I'm guessing if I order a Supagro kit it will be well developed too (which I've already added to my next order). 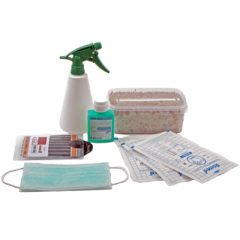 Along with this starter set I also added some alcohol swabs to clean small surfaces, and I'm about to order more grow kits and will add a surface disinfectant spray to my order. (which I recommend adding if you're ordering this set and don't have anything around the house to disinfect surfaces with. I'm going to use it to clean the surface of the fridge tray for example, during soaking), along with a soaking bag. If your fridge needs some cleaning then the spray or soaking bag could be good ideas. With the Freshmushroom kit I simply used the alcohol swipes though for the fridge tray and placed it on some kitchen paper in the fridge, along with clean hands, and as mentioned I had no contamination issues. Since I'm ordering more grow kits including a "Standard" XL grow kit (which may have less-developed mycelium initially), the mush bag and cleaning spray is probably a good idea. But not essential for this starter kit or Freshmushrooms in my experience. Just make sure your hands are very clean and don't breath directly onto the kit. What I additionally appreciate is the service here - any questions I had, even beginner's questions not listed in the faq (such as whether I could use dutch tap water for the soaking, which is a yes by the way), were quickly and helpfully answered, and the shipping was quick. I think it's a good store, that sells healing medicine, for which I am very grateful. I'm so grateful to have access to this stuff. I really appreciate the store and feel I'll be a regular customer for a long time. Thanks guys. I'm gonna go order now! It was my first experience in mushroom cultivation and it was, in my opinion, a success. Following the instructions as the indications say, grew almost 30 grams dry in the first flush.